Coming out of SIHH, it was the complicated watches from IWC Da Vinci Watches collection that were getting most of the attention. This includes both the very complicated models like the Perpetual Calendar Chronograph and the smaller complications such as the ladies’ moonphase. But for me it’s the time-and-date model that stands out as my favorite piece in the collection. It piqued my interest a few weeks ago, but after spending a few days with it I found myself enjoying it even more than I’d expected. There’s no two ways about it – the Da Vinci collection is polarizing. People generally love it or hate it. 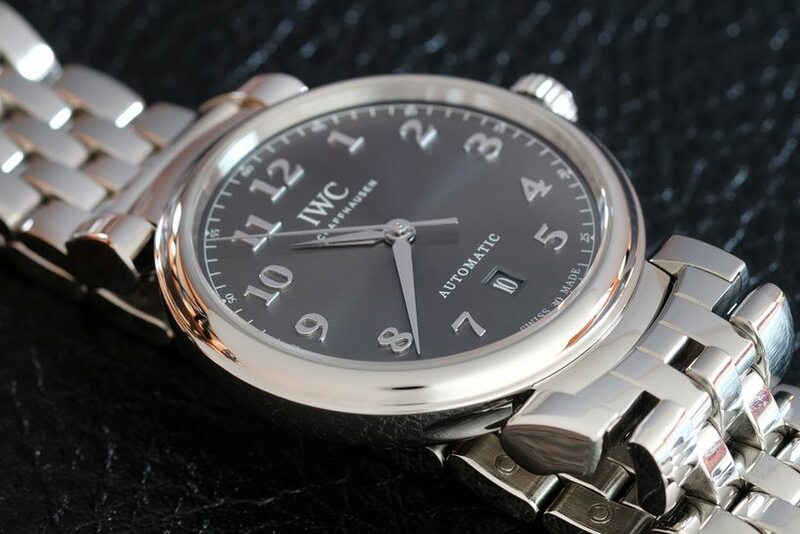 I’d say that while I have no vitriol directed towards these stylized watches, they’re definitely not my favorites from Swiss IWC and I’d probably even fall closer to the second camp than I would to the first. However, there’s a lot to love about the Da Vinci Automatic, even if you might not think it’s a watch you’d naturally gravitate towards. Think of this watch as the pure distillation of the codes that comprise the new Da Vinci collection, with everything that makes them what they are and nothing extra. 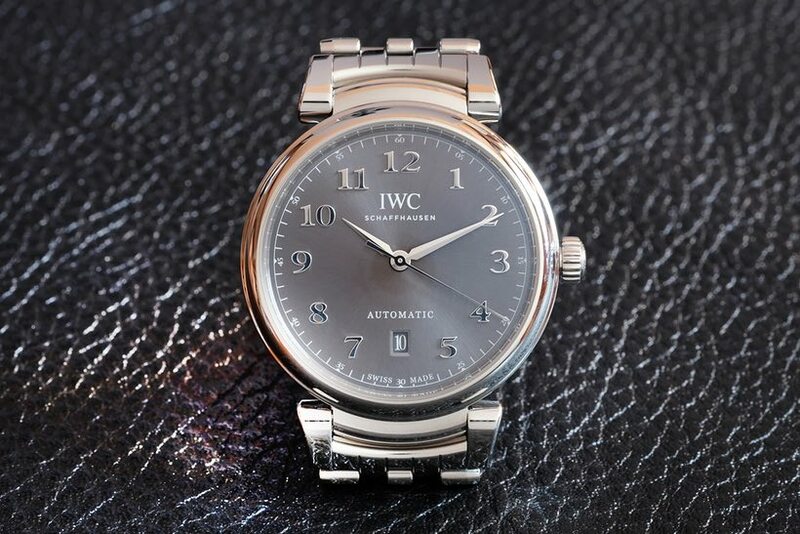 The watch starts with a 40mm stainless steel case and I really applaud IWC for resisting the temptation to make this a 42mm beast. I think some of that comes down to wanting the watch to appeal to both men and women, but regardless of the reasoning, I’ll take it. 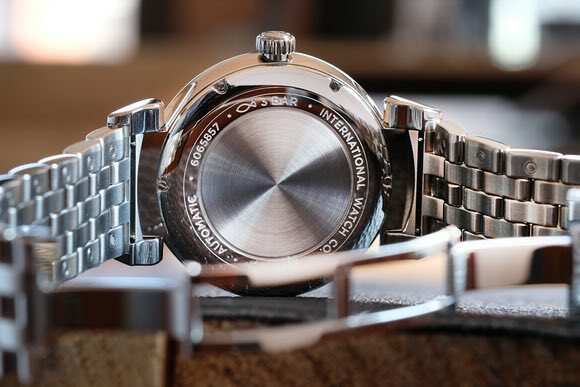 Immediately you’ll notice that rounded bezel and the distinctive articulated lugs. The former nicely frames the dial and gives the case some extra oomph. The latter, paradoxically, look big but actually help the watch wear smaller than you’d expect. They are hinged at the case, and carry the bracelet end link, nicely hugging the wrist and holding the case down tight. That said, they’re still a lot of look and one of the reasons many find the Da Vinci tough to imagine on their wrist. I found them much more comfortable than expected and when paired with the bracelet they don’t look nearly as dramatic. The dial is my favorite thing about the new Da Vincis though. Hands down. It’s not even close, really. This model has a rich slate sunburst finish that turns various shades of blue, purple, grey, and brown, depending on the light. Even just wearing the watch around the office, I could get three or four dial colors on the walk from my desk to the conference table. The hands are nice and sharp and the fancy numerals (which are definitely not Breguet numerals, by the way) are applied and stand tall off the main dial. Even that date window at six o’clock is finely cut and the slim numbers just show though.